Recently I saw a bakery window advertise their "famous cake". That got me thinking of infamous cakes. 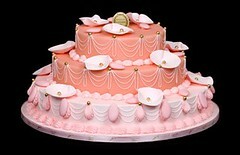 What cakes have changed history? Or at least upset a lot of people? Here are the findings of my research. In November 1946 the Joint Army-Navy Task Force Number One was celebrating the successful operation crossroads nuclear test at the Bikini atoll. 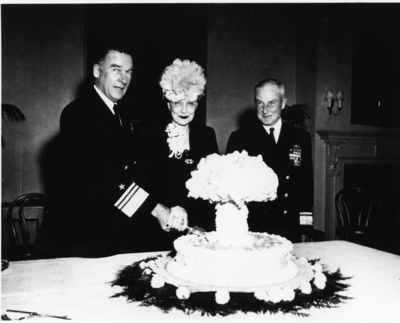 With a mushroom-cloud shaped cake. The photo, showing Vice Admiral William H.P. Blandy (commander of the task force), his wife and Rear Admiral Frank J. Lowry, was published in Washington Post. A minister, Arthur Powell Davies, delivered a blistering sermon around the picture, giving voice to the nascent disquiet with nuclear weapons. Conelrad Adjacent has a good essay about the whole affair and its (ahem) fallout, far more detailed and interesting than anything I could write. Anne Marie Helmenstine even has a recipe, although she notes that the original was based on angelfood puffs. Possibly another reason for Davies to be upset. The Swedish artist Makode Linde managed to set off a firestorm in April 2012 with a cake during the opening of a exhibition at the Museum of Modern Art in Stockholm. The cake was shaped like a black Venus from Willhelmsdorf, with his face made up like a golliwog. As it was cut up, he could be heard crying. That the first cutter was the very blond, smiling Swedish minister of culture, behaving like at any other cake-cutting ceremony, made things even better. Of course, the exhibition was about female genital mutilation. And the artist is black. And has been using golliwog faces and blackface characters to poke at racism for quite some time. But context is easily lost on the Internet, and the rest of the world pounced on those racist Swedes (helped by the local easily offended people). I think Johan Palme expressed it best when he pointed out that the whole event is the artwork, and a pretty subtle one. While Makode Linde had to work for it, others achieve what Anthony Bourdain called "an edible hate crime" with much less effort. In this case it was Sandra Lee's Kwanzaa cake recipe. Besides being apparently pretty inedible, one can make a reasoned argument it is indeed disrespectful. Which of course helped the video go viral, to the degree that some people actually make the cake as an ironic gesture. She also managed another disrespectful cake, a Star of David cake for Chanukah that was made with marshmallows, which are not Koscher. Oops. However, the real creator of the cakes was Denise Vivaldo, who has a hilarious confession of how the disasters came about. Although a confession is probably not supposed to blame the other gal so much. The Sachertorte has sometimes been claimed to have helped the Congress of Vienna get its act together... but it is unlikely given that Franz Sacher (1816-1907) was not born yet at the time. However, prince Metternich was the host of the banquet where it was originally served, so that is a likely source of the confusion... except that it might have been invented under Countess Esterhazy instead. Good food acquires myths rapidly. Little-endians vs. big-endians, or in this case cake separatists and unifiers. 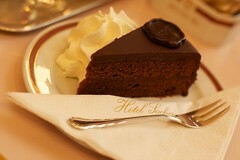 And a real Sacher-tort. While most food affects mood through the expedient of filling bellies, clogging arteries with sugar and fat, and maybe even through delightful taste, some food actually is psychoactive. Caffeine in the Tiramisù is obvious, and some cakes do have a bit of alcohol in them (I had a quite good whiskey cake recipe a few years back). Nutmeg is certainly psychoactive in high doses, probably too high for most cakes. However, I have never been convinced by the claims chocolate affects the brain much, beside the caffeine and theobromine content - the other interesting substances like anandamine and phenylethylamine are either present in low concentrations or metabolized quickly. But using standard ingredients is of course too limiting. So why not add melatonin, the natural diurnal rhythm hormone to cakes in order to make them extra relaxing. Lazy Cakes were brownies with about 8 milligrams melatonin per cake, branding themselves as dietary supplements (since melatonin is not an approved food ingredient). Unsurprisingly, this proved controversial, especially since children could presumably eat them and the melatonin might interact with drugs or driving. Apparently the response was rebranding. 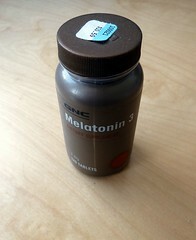 Personally I suspect the biggest problem is that the melatonin may reset your diurnal rhythm a bit too much if you take it early in the evening or even the afternoon: of course, maybe becoming an early bird next day is desirable if you want to have a lazy day. Of course, once you open the ingredient list to the full pharmacopoeia the sky is the limit. I have heard stories about Viagra ice cream, and Viagra cakes certainly seems doable. Spanish fly has no doubt been put in cakes, not just pastilles (the Matrix movie doesn't count). Being a cognitive enhancement guy, I have occasionally pondered whether it is possible to include modafinil in some dish without a too awful taste. The problems are many: dosage matters when you want pharmacologically effective desserts, and regulating it when dealing with tasty creations will be tough. While toxic desserts certainly have a decadent charm (must see what Gray and Lucan suggests in The Decadent Cookbook), ideally they should be safe and consensual. Of course, some cakes are not safe and consensual. In 2004 a person working at the Bergianska botanical garden in Stockholm served homemade cheesecake laced with cannabis to his co-workers. (News story 1, news story 2, in Swedish). He had tried the cake mix himself and did not think it was too strong; according to himself he did merely intend them to become happy. He miscalculated, since the co-workers were apparently far more sensitive than him and suffered nausea, lethargy and hallucinations. 13 went to the hospital. The use of cannabis in baked goods is of course nothing new. Perhaps the most classical recipe is the one for Hashish Fudge in The Alice B. Toklas Cookbook (which the author claimed was given to her by Brion Gysin, perhaps as a deadline filler). That particular recipe got cultural traction in the 60s, even leading to the title of the 1968 Peter Sellers film "I Love You, Alice B. Toklas". That is another way of gaining perennial cultural relevance. There is no shortage of attacks on famous (and infamous) people using cake: what better way of embarrassing them or showing how clownish they truly are? The practice has a fair amount of history. It is interesting to note that in English this is known as pieing, while in Swedish this is known as tårtning - literally cakeing. The reason for the difference may be that in Anglo-Saxon countries pies are somewhat more common as desserts than in Sweden. Since the dish is more of a statement than an exercise in cooking the simplest kind available will do, which makes whipped cream or custard acceptable (but in my opinion does show a bit of lack of dedication). The real test of character is of course how the victim handles the attack - quite often they come across as far more dignified than the typical activist during the subsequent events. An attack on Canadian minister Gail Shea got MP Gerry Byrne to suggest that pie-throwing should be reviewed under the legal definition of terrorism. “When someone actually coaches or conducts criminal behaviour to impose a political agenda on each and every other citizen of Canada, that does seem to me to meet the test of a terrorist organization” he said. However, the standard definition of terrorism typically is based on the use of violence and intimidation in the pursuit of political aims, aiming the terror or violence effect at the general public. Pieing aims at particular prominent people and does not aim to do physical harm (the reputation or psychological harm might truly hurt, however). The risk of public pieing hangs over the head of just some people, not all. So calling it terrorism would stretch the already overstretched word far beyond the breaking point. Pieing is not morally neutral and certainly criminal, but it is not terrorism. In terms of impact (heh...) I guess the attempt on Rupert Murdoch during the 2011 phone hacking hearings (still, it was just shaving foam, and his wife clocked the assailant) and the hit on finance minister Bosse Ringholm during his 2001 budget walk (traditionally the minister walks from his department to the parliament building with the budget proposal, surrounded by journalists and pundits) come to my mind. The 1977 comeback of anti-gay rights activist Anita Bryant, "at least it is a fruit pie", is also classic. Here is another list of five other notable pie-tossing incidents. The story is that Queen Marie Antoinette responded "Let them eat cake" ("Qu'ils mangent de la brioche") when told the peasants had no bread. This is yet another one of those classic factoids where practically nothing is true or verifiable (are we seeing a pattern here?) It was attributed to a "great princess", not Queen Marie Antoinette, and was first mentioned in Jean-Jacques Rousseau's Confessions, which was written when she was nine years old (the Wikipedia entry notes: "he may have invented the anecdote, as Confessions was, on the whole, a very unreliable autobiography."). There doesn't even seem to be any evidence it was attributed to her during the French Revolution. And brioche is more of a bread than a cake, although one could combine it with fruit, chocolate and topping to make a dessert. King Adolf Frederick of Sweden died after eating an excessive meal, ending with 14 servings of his favourite dessert: semla served in a bowl of hot milk. Count Johan Gabriel Oxenstierna remarked that "it was not the most brilliant way of dying, but rather a dean's death." 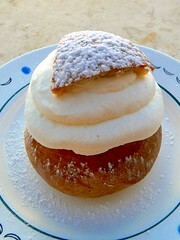 It can of course be debated whether semla should be regarded as a cake proper, or just a dessert. 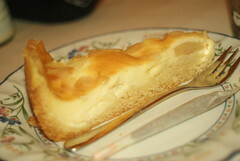 It is close to the border: it is a sweet bread and it has both filling (marzipan) and a cream layer. But serving it with hot milk clearly moves into dessert territory in my opinion, since cakes are at most served with some cream or sauce at the side, not swimming in it. In any case, I prefer mine dry. The last sweet years or bad romance? Handling infidelity in the nursing home - I blog about the interplay of dementia and the ethics of infidelity, triggered by a newspaper report that the ethics panel of the National Board of Health and Welfare in Sweden argued staff should not interfere even when the family is against it - the autonomy and welfare of the patient is prior. My talk at TEDx Hasselt about the Fermi question is now up. Whatever the answer is to Fermi's question, it is going to make the world a stranger place.